Freezer Cooking Tips & Tricks + Make Ahead Freezer Meals Recipe Ideas! 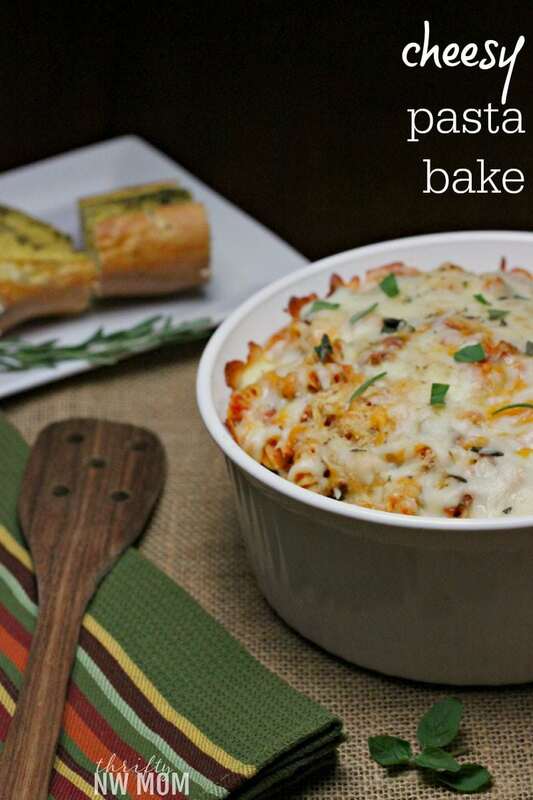 Freezer cooking is a great option to help busy families get homemade meals on the table. It is also a frugal option since you can focus on using recipes for ingredients you might be stockpiling. 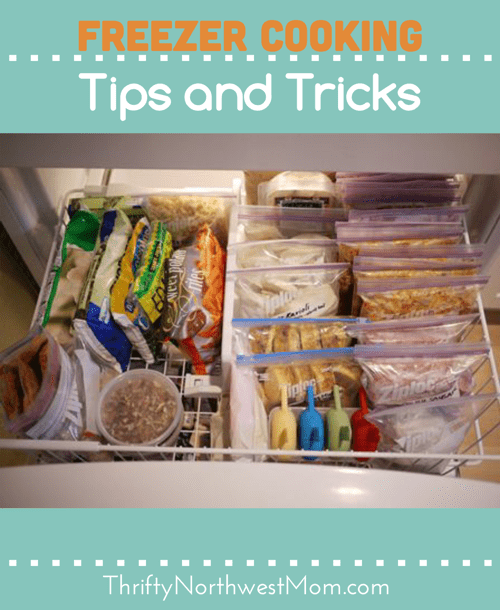 Also, just by having a ready-made meal in the freezer will help eliminate getting take-out on those busy school nights and can help you cut back that food bill. Freezer cooking is also something you can do with friends and family. You can all make one or two freezer meals and then exchange them (i.e. you would make 4 portions of a freezer lasagna meal, and three of your friends would make 4 portions of a different meal each. You could then get together and exchange those, and you have 5 freezer meals for the week, but you only had to make one recipe!). Freezer cooking is something that can also be a great way to use leftovers, and that will help you save a lot of money right there as well. We have some tips on that below too. One last think that I love about freezer meals, is that they are a great way to bless someone else with a meal. If you have a friend or family member having a baby, or dealing with an illness, or just to busy to cook, you can bring by a freezer meal or two and chances are they will really appreciate that! A few weeks ago I started our fall freezer stocking a little early after we eagerly picked 12 pounds of blueberries at the U-Pick farm in Snohomish. Once I admitted that I was going to have to freeze a ton (or ~10 pounds as it was) I realized our freezer needed some serious attention. 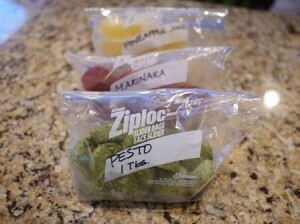 I love the Food Saver as I think it keeps the food the freshest, but freezer bags may be more affordable then the food saver, so you will have to figure out what works best for you. 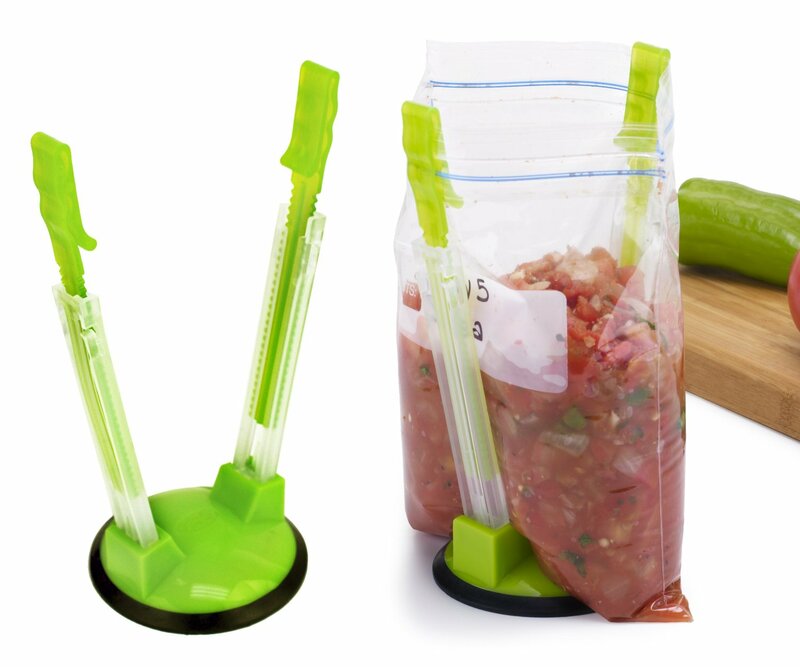 If your using Freezer Bags you can get these handy stands to make the bags stand up while you are filling them. They are very handy to have on hand, and make the process of filling your bags much easier! Disposable foil pans – these are nice for meals that are not easy to assemble in a bag, like lasagnas and casseroles. You can get them at the Dollar Store, but this is a great deal if you plan to do regular Freezer Cooking ($.50 per pan, and these are heavier then the ones you will get at the Dollar Store). I can fit some of these into my Food Saver bags, and prefer to seal them that way, but two layers of foil wrapped well should do the trick too. 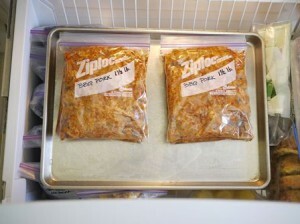 These Baker Sheets come in very handy if you need to freeze items before putting them in bags. If you like to do things like Berry Picking these are perfect. You lay the berrys out on these (add some parchment paper first) and freeze them for a few hours, then transfer them into a freezer bag for longer term storage. This keeps the berrys from clumping all together as they freezer. I got a set of three recently at Costco for under $15 and love, love, love them! Soups freeze great! I will often leave out noodles or rice and add them in when I am warming the soup up (as they can get mushy). I will also freeze leftover soups and then add some breadcrumbs and cheese later on to make a tasty stuffing for chicken or pork chops. Eggrolls – these freeze great. Just wrap them in the wrappers, and lay out on baking sheet to freeze, then transfer to freezer bag. Fry up from frozen when you are ready to use. You can also check out our article on 8 Foods You Can Freezer (for more ideas on food you can save in the Freezer, that might surprise you)! You can find the recipes for these Freezer Cooking Meals here too! The 1st things tackled when I got home from shopping were the ‘no work / no cook’ items on the list. 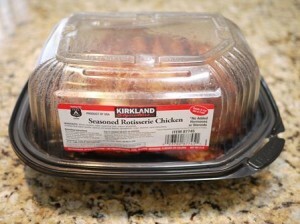 The shredded rotisserie chicken was hands down the best find in my freezer idea search. It’s so brilliantly simple it’s hard to believe I never thought of it myself, but this stroke of genius came from Clean Mama. We use this stuff for chicken pot pie, chicken & dumplings, soups, quesadillas, salads, etc. etc. I simply shredded it and put it in freezer bags – SO EASY! I froze the marinara and pesto in mini muffin tins (which don’t absorb flavors like plastic), turned them out onto wax paper to harden the rest of the way, then tossed them into flat bottom freezer bags. 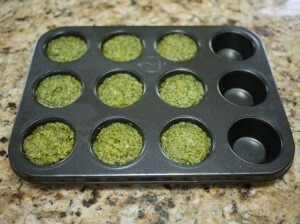 Mini muffin tins hold a little over 1 tablespoon so they’re great for things like this. For any of the protein dishes that were cooked (as well as the cookie dough), they were all put into quart freezer bags and flattened before freezing them on a sheet pan. This way they can stand up and are easy to flip through to quickly find what I need. 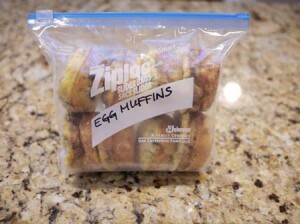 The egg muffins were cooked in regular muffin tins then frozen on the sheet pan before being lined up in the flat bottom freezer bags. These are a new favorite grab & go breakfast item in our house. The calzones were individually wrapped in plastic before going in the freezer bags and the banana bread was cut in half and each half wrapped in plastic before both pieces went in the bag. When all was said and done, this was the end result. A well stocked and organized freezer. What are your favorite tips for making freezer meals at home? 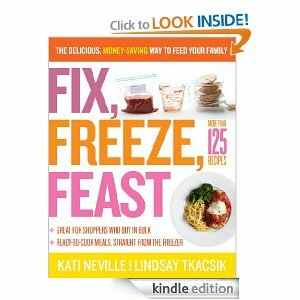 Fix, Freeze, Feast: The Delicious, Money-Saving Way to Feed Your Family (one of the most popular Freezer Cooking cookbooks!) – Jen has this cookbook & loves it!! Kristi is a stay-at-home-Mom to a crazy, wild, typical 3 year old boy. She’s always used her freezer but got serious about freezing meals and meal starters when she got married and realized most recipes make way too much food for 2 adults. And now that they have a little boy running around non-stop it’s that much more important to have food pretty much ready to go morning, noon, and night for us as well as for impromptu entertaining. are there recipes to share for these? Misty- there are recipes linked for the Sloppy Joes & Egg muffins – just click on them to be taken to the page. Kristi will work on getting us some of the other recipes, too. I would love to get the calzones recipes!! 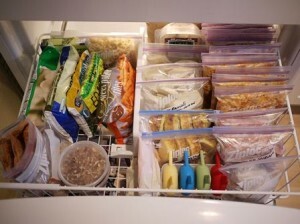 I have the same type of freezer and this gives me hope that I can have an organized freezer again! Thanks! onceamonthmom.com has some awesome freezer recipes. Just wondering what you do with the egg muffins? Are they just scrambled eggs cooked in a muffin tin? And how do you reheat them? The recipe link is listed below but I microwave 2 on a plate, right out of the freezer bag, for 1 minute on high. Then splash them with my favorite hot sauce and they’re good to go! So good! Loved the article! 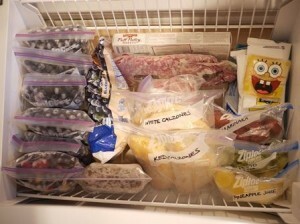 I also freeze meals and use a small chest freezer so I can hold alot of frozen veggies and fruits. Could I get the egg muffin recipe? I also want the egg muffin recipes! mornings on the run tend to be non-protein around here. This look fabulous. Thank you for the inspiration – your freezer looks so organized! I have been baking and cooking all day but want to try this one too. Where can I find the Flat bottom freezer bags? I have searched everywhere!!!! Thanks!